Specialised in delivering casual gaming experience, the developers at UNIT9 Games wanted to take a step further and create a game with a much deeper gameplay and more complex design. 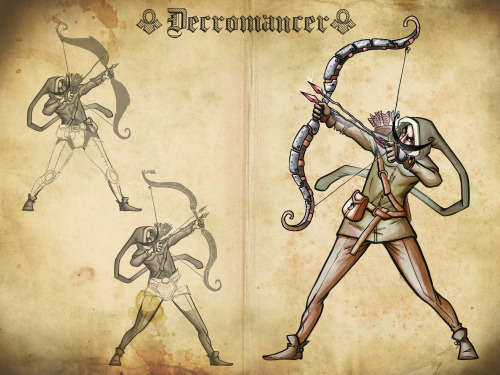 Decromancer is a tactical battle card RPG that puts the player at the core of a whirlwind adventure across an epic single player campaign! My role within Decromancer was as the lead copywriter, narrative orchestrater and head writer, as well as operating as a creative consultant for the game, feeding back and offering suggestions on gameplay, flow and pacing, quest design, art assets and UI flow. This was a large and fulfilling project, with roughly 25,000 lines of unique dialogue/copy and growing as the game is expanded. Huge amounts of world building was required, from internal game development lore, narrative planning, race relations documents all the way through to in game descriptors, quest dialogue and loadings screen tips. Some examples of copy can be found below, by hovering over the artwork from the game. Many, many more examples can be found on the games official Tumblr. Training a good archer takes time and money. One has to build up their fitness, their accuracy… All this behind the scenes, unglamorous toiling away. It’s hard to build up support for funding. It’s much easier to just get new shiny bows that sparkle in the sunlight. That’s something people can get behind! Equipped with these new wondrous weapons, the archers can close their eyes and shoot off two arrows instead of one! Surely one must hit something! As more and more battles go by, a Moloch finds themselves in a bit of a pickle. Their tough spiky skin is such a great asset that it needs a bit of a facelift now and then to ensure maximum efficiency in impaling people, but they can’t exactly lose their spikes to do this! Their solution has proven to be truly elegant: they grow their new skin, with new tougher spikes underneath their old one, and when the time is right they quickly burst out of this old shell and leave it behind to impale any enemies silly enough to hit it. Some joke that in order to join the army, Wildlings have to pass a wobbliness test. They certainly eat enough to make you think their lives depend on being the most rotund on the battlefield. The more experienced have learned their bulk attracts the enemy’s attention so they cover themselves in heavy armour. Having to carry the extra load around makes them so hungry though that when they see enemies on the brink of death they enrage, pushing that little bit harder to do more damage. Dinner is served! Chelonii are the slow and powerful tanks of the battlefield. Their shells are impervious to almost all attacks and their heavy clubs can rain destructive blows on any battlefield structures. Rumours abound about their clubs, which are organic and coated with the same hard shell as the Chelonii themselves. Some say that when a Chelonii hatches from it’s nest of eggs, it takes its weaker siblings and releases a chemical which changes their growth, turning them dense and shielded; eventually forming into a club that will be carried for life. The clubs are like family to them and if lost or destroyed, they will often stop fighting and retreat into their shell, only emerging once totally alone. 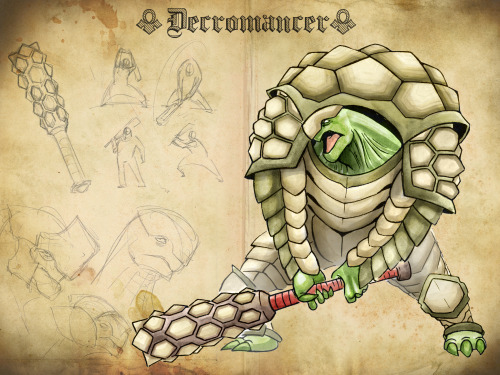 They are known among the Carnids as siegebreaker, as a small group of Chelonii sent forth from a city gates during the night can cause incredible amounts of havoc in a besieging army, destroying all the large siege weaponry and ignoring all the small swords and hammers of the foot soldiers. They will continue this slow rampage for days, as the long life cycles of the Chelonii allow them to stay awake and active for weeks at a time before needing to sleep. These mysterious preachers come from deep within the heart of the desert, and people from towns bordering it whisper rumours of great yearly gatherings of thousands of shaman, come together in one place to trade stories. No outsider has ever had first hand experience of such a gathering however, so they remain just that: rumours. Their entire culture is orally disseminated, and it is these strong oral traditions that tie their race together. Passing down and remembering stories from the elders is one of the most important parts of a young shamans life, second only to their almost compulsive need to preach to those around them about the memories of the event which made this world as it is now. For this is the central element to shaman’s culture, the fact that their ancestors supposedly bore witness to an extraordinary event that evolved all life right before their eyes. Such importance is given to this tale, that it represents the only physical manifestation of their beliefs: the story is carved as a totem out of the tusk of an elder and each shaman dutifully carries one with them. Whether one chooses to believe them or not, there is one thing that everyone agrees on: their memory is legendary! In fact, a phrase has come among the people: “A Shaman never forgets”. And neither does anyone who dares cross them. If threatened, they wield their massive frames with astounding grace, and show great skill at wielding their large onyx axes.